North Atlantic Books, 9781556438073, 400pp. The Passionate Mind Revisited takes readers on a liberating inner journey into the workings of their mind that can transform the way people look at themselves and the world. This expanded inquiry reflects the authors’ own and the world’s evolution since The Passionate Mind came out in 1974. The original book focusing on the individual is now extended to social and philosophical spheres and global challenges, exploring how the world’s life-threatening dramas are largely a function of people’s genetic and cultural conditioning, worldviews, beliefs, and values. Kramer and Alstad assert that humanity is on an evolutionary cusp requiring further awareness and conscious social evolution. Worldviews can create rigid beliefs and narrow identities that are destructive in a world of global impact. While acknowledging the fallibility of any mental construction, the book offers an evolutionary worldview deemed more likely than traditional worldviews or scientific materialism. In exploring what it is to be a human social animal, The Passionate Mind Revisited offers fresh vantage points on life’s core issues: the nature of thought, authority and belief, pleasure and pain, desire and fear, identity, love and care, freedom, power, gender, time, meditation, violence, and evolution. By demonstrating how to inwardly see and break through one’s conditioning, the authors delve deeply into the nature and processes of the mind, including how subjectivity filters perception. This approach to self-inquiry can help free people from mechanical responses that develop from unexamined beliefs and habits. Dysfunctional worldviews and their values inhibit the creative solutions much needed in a perilous world of runaway change. This book, through its discussion and methodology, fosters curiosity and truth-seeking. Kramer and Alstad offer new insights on personal and global issues that can facilitate a necessary shift to conscious social evolution. Joel Kramer and Diana Alstad are co-authors of The Passionate Mind Revisited: Expanding Personal and Social Awareness (2009) as well as of The Guru Papers: Masks of Authoritarian Power. They have written and taught together since 1974 on evolution, spirituality, relationships, values, awareness, yoga, and social issues. Visit their website at www.joeldiana.com. Joel Kramer, the author of The Passionate Mind, did post-graduate work in philosophy and psychology and was a resident teacher at Esalen Institute (1968–1970). He is a pioneer and legend of modern American yoga whose evolutionary vision of yoga freed it from its authoritarian roots, re-visioning it for the West. Diana Alstad, a Woodrow Wilson Fellow, received a doctorate from Yale University in 1971. She taught in the humanities and initiated and taught the first Women’s Studies courses at Yale and Duke. She envisioned the Yoga of Relationship and developed it with Kramer. "In this timely, brilliant, and original tour de force, Kramer and Alstad, two of the seminal thinkers of our time, have given us a remarkable gift: a hopeful, unsentimental analysis of both how we got here and where hope for a viable future lies. If you read one book this year, let it be The Passionate Mind Revisited. It will broaden your individual and social awareness and change your life." "Don't go to the movies. Put down your magazine. Shut off your computer. Read this book. It will show you what is really happening now. Being able to understand how the world is changing and what that means to you and your children is the real news of today. Accessible and profound. Read it and weep—or clap with joy. This truly is our future and, more importantly, our choice." "The Passionate Mind Revisited is a fearlessly rational engagement with subjects we all too often accept as beyond rational thought—emotion, spirituality, relationships, and life in a time of conflicting realities and an endangered planet. It's a fine and important book, and deserves to be widely read." "Whether The Passionate Mind Revisited is for you depends on your interest in philosophy, human behavior, epistemology, and personal development. This ambitious, broad-ranging book is by necessity abstract, but for philosophers, Diana Alstad and Joel Kramer are miraculously clear and lead the reader by meticulous steps to some surprising conclusions." "Nobody does a more masterful job of folding back the fabric of our individual, cultural, and human attachments and revealing hidden denials, hypocrisies, and paradoxes than Diana Alstad and Joel Kramer. They are among the very few who can open hidden doors to rooms in your house you never knew were there—to both delight and disturb. This book will change the way you look at things—perhaps everything. Are you courageous enough to risk that? Reading this book is a glimpse into what the human mind is capable of perceiving and the mindset of the evolved human mind in the next millennia." "In 1974 The Passionate Mind took me on a journey into my deepest self; it made me dance in the dark. Now, in The Passionate Mind Revisited, the entire worlds—the cosmos in which that self resides—is explored. The investment many children of the ‘60s and ‘70s made in freeing ourselves is now turned toward a globe in need of freedom from hunger, poverty, and violence. The Passionate Mind Revisited is a critical tool for social, political, and ethical transformation." "A welcome infusion of clarity, brilliance, and inspiration that will very likely blow your mind. This profound book is a philosophical, intellectual, and spiritual Rosetta Stone—not a glib compilation of simplistic answers but a critical frame of reference that challenges the way we think about the nature of thinking itself. The Passionate Mind Revisited is essential reading for anyone trying to get their bearings amid confusing and contradictory claims and ideas that have long been promoted about the meaning of self-awareness and social consciousness. If you intend to delve into any other discussion of the powerful social, religious, psychological, ecological, and ethical changes confronting current and future generations, read this book first or you may miss the crucial context that will help you make sense of it all." —Keith Harary, PhD, executive director of the Institute for Advanced Psychology and author of Who Do You Think You Are? "The phrase ‘looking inward’ has become anathema to many social reformers who put their emphasis upon external action. In turn, this ‘knee-jerk’ activism has been criticized by those who advocate inner development. Diana Alstad and Joel Kramer believe that both approaches can occur concurrently and provide a framework for this process in this brilliant book. If the twenty-first century is not be the last gasp of humanity’s time on Earth, the ideas and practices articulated by these two innovators will deserve credit." "A breakthrough in spiritual realism, pioneering in its confrontation of life’s perennial tough judgment calls, and courageous in its intolerance of the cryptoscientific pseudo-spiritual gloss, this book will meet you where you really live." "The Passionate Mind Revisited has afforded me deeper, clearer, more pragmatic approaches to my work and to the future of humanity and life on Earth. My worldview and experience of the spiritual dimensions of life are both more grounded and more expansive from the exposure to their thinking and exploration of their ideas. Much awaits you in exploring your own passionate mind! And the Earth needs our passion and clarity more than ever." "In times of transition and not knowing, visionary artists dance with the possibilities that they sense emerging for us. Diana Alstad and Joel Kramer have seen a magnificent potential for humanity and have written down their insights in an inspiring and practical way. I recommend their book as medicine for all who are curious about what might lie beyond the present confusion and challenges." "Nothing today is more critical than making sense of our times and what they ask of us. Diana Alstad and Joel Kramer bring important insight and integrity to this difficult task. Spiritual and scientific sacred cows get equally unsparing treatment. The Passionate Mind Revisited makes a valuable contribution at both a personal and a societal level." "Diana Alstad and Joel Kramer are exciting critical thinkers for our times, who, as passionate individuals, offer us provocative insights to investigate and navigate our own terrain in ransitional times. The Passionate Mind Revisited is a classic reinvented for this dynamic historic moment." "Kramer and Alstad argue with clarity and passion that the simplistic "be here now" mindset sweeping contemporary pop psychology tragically fails to account for how the past and the future are always part of how we construct any "now" and any "here." I found myself cheering at their insistence that negating the future in the name of spiritual enlightenment amounts to an amputation of our intrinsic capacity to take future consequences into account—a task of vital importance at this crucial stage in our evolutionary adventure." "It is clear that The Passionate Mind Revisited is a seminal book for our time. One of the core beliefs held by nation-states and most individuals is that "more is better." What a wonderful gift we have been given to challenge our unexplored assumptions to help us shift to a world that can fulfill us all." "The Passionate Mind Revisited is a promising re-visioning of age-old philosophical dilemmas in a contemporary setting with important social and political implications. The authors are poignantly aware of the effects that Eastern thought and practice have had on spiritually inclined individuals in America over the past half-century, and they challenge head-on many assumptions flowing from their own and others’ earlier teachings. Their systematic demonstration leads to the stirring conclusion that a spiritually aware, caring life has to be lived future-oriented and in time-not in some timeless realm. By illuminating the roles of thought and diversity in a life of spiritual awareness, the authors’ book would re-orient and rejuvenate spiritual work, bringing it back into the world of time to become more effective and socially relevant." "In this book, Diana Alstad and Joel Kramer have combined more than thirty years of writing, experience, and thinking to construct for the reader a unique lens with which we might examine our worldviews, ideologies, beliefs, fears, and hang-ups. We see more clearly the consequences of our collective failure to free ourselves from the spiritual and intellectual compulsions that have led us to the brink of planetary doom. The coauthors urge all of us, if we are truly serious about planetary survival, to continue the struggle to engage collectively in the evolution of our consciousness. I commend them for this book, a superb achievement." 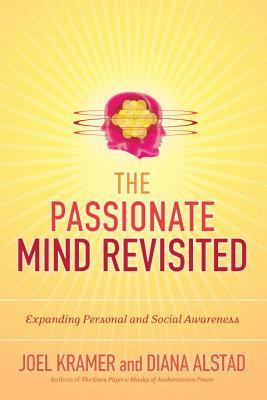 "The Passionate Mind Revisited is an excellent resource for expanding personal and social awareness. Diana Alstad and Joel Kramer integrate many cross-cultural and interdisciplinary ideas to illustrate how we can continue to grow, create, and expand during times of uncertainty and open to possibilities not considered before." "[The Passionate Mind Revisited is] a provocative challenge to existing worldviews and a celebration of ‘conscious social evolution.’"
“The Passionate Mind Revisited takes readers on a liberating inner journey into the workings of their mind that can transform the way people look at themselves and the world… In exploring what it is to be a human social animal, The Passionate Mind Revisited offers fresh vantage points on life's core issues: the nature of thought, authority and belief, pleasure and pain, desire and fear, identity, love and care, freedom, power, gender, time, meditation, violence, and evolution. By demonstrating how to inwardly see and break through one's conditioning, the authors delve deeply into the nature and processes of the mind… This book, through its discussion and methodology, fosters curiosity and truth-seeking. Kramer and Alstad offer new insights on personal and global issues that can facilitate a necessary shift to conscious social evolution.